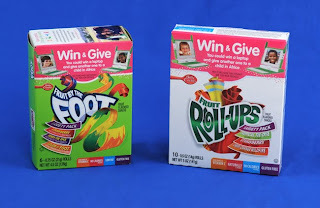 Right now in specially marked boxes of kid favorites - including Fruit Roll-Ups, Gushers, Fruit by the Foot, and Stickerz & Shapes - your child could win one laptop to keep and Betty Crocker Fruit Flavored Snacks will donate another to a child in Africa. Each day from now through May 30, 2010, one laptop prize will be awarded to a U.S. winner. For every laptop won, one laptop will be donated to an African child through One Laptop per Child, an organization that creates educational opportunities for the world´s poorest children by providing each child with a rugged, low-cost, low-power connected laptop with content and software designed for collaborative, joyful, self-empowered learning. For your chance to win, simply enter the unique online code printed on participating Betty Crocker Fruit Flavored Snack packages on www.WinOneGiveOne.com. Because I decided to share this with you all I was provided with two boxes of a variety of Betty Crocker Fruit Flavored Snacks and a $25 donation to One Laptop per Child on my behalf. BUT that's not all! Now you have a chance to win. 2 boxes of Betty Crocker fruit snacks and a $25 donation to One Laptop per Child on your behalf. All you need to do is go to Betty Crocker's website and leave me a comment below telling me what Betty Crocker fruit flavored snacks are your favorite. :) That's it. For extra entries you can do the following. Just leave a comment for each so I know you did it. Giveaway will end February 28th at 11:59 PM EST. Winner will be chosen using Random.org. My son loves the gushers, he calls the fruit things with juice in the middle that squirts out. I love strawberry fruit by the foot!